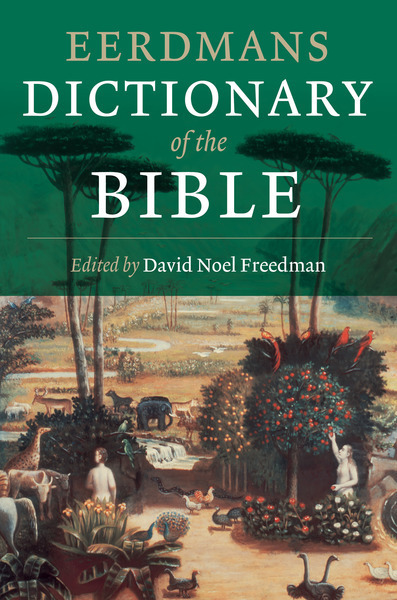 Eerdmans Dictionary of the Bible was written by David Noel Freedman (editor-in-chief), Allen Myers (associate editor), and Astrid B. Beck (managing editor), and published in 2000. The Bible dictionary gathers nearly 5,000 alphabetically ordered articles that thoroughly and clearly explain all the books, persons, places, and significant terms found in the Bible. The Dictionary also explores the background of each biblical book and related writings and discusses cultural, natural, geographical, and literary phenomena--matters that Bible students at all levels may encounter in reading or discussion. Nearly 600 first-rate Bible authorities have contributed to the Eerdmans Dictionary of the Bible. Intended as a tool for practical Bible use, this dictionary reflects recent archaeological discoveries and the breadth of current biblical scholarship, including insights from critical analysis of literary, historical, sociological, and other methodological issues. The editorial team has also incorporated articles that explore and interpret important focuses of biblical theology, text and transmission, Near Eastern archaeology, extrabiblical writings, and pertinent ecclesiastical traditions--all of which help make the Eerdmans Dictionary of the Bible one of the most comprehensive and up-to-date one-volume Bible dictionary on the market today.